A repository is a logic unit of a domain. PowerCenter applications access the repository through the PowerCenter - Repository Service (Process). and pmrep command line programs. You can view repository metadata in the PowerCenter - Repository Manager. The Informatica Metadata Exchange (MX) provides a set of relational views that allow easy SQL access to the PowerCenter metadata repository. The views are created during the installation of the upgrade of the repository with the help of mxbld file query (for instance for oracle oramxbld.sql). 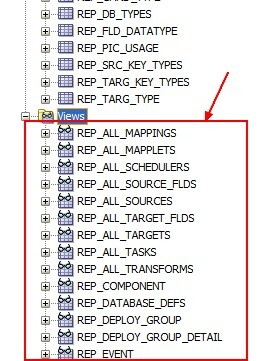 You find then this view in the PowerCenter Repository schema and they begin with REP.
More informations on the content of the views in the repository documentation (chapter 15. Using Metadata Exchange View). Global repository. The global repository is the hub of the repository domain. Use the global repository to store common objects that multiple developers can use through shortcuts. These objects may include operational or Application source definitions, reusable transformations, mapplets, and mappings. Local repositories. A local repository is any repository within the domain that is not the global repository. Use local repositories for development. From a local repository, you can create shortcuts to objects in shared folders in the global repository. These objects include source definitions, common dimensions and lookups, and enterprise standard transformations. You can also create copies of objects in non-shared folders.